Thanks to Steven Goldsmith, who submitted this post about his colleague Mary-Dell Chilton. 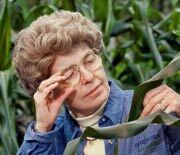 Mary-Dell Chilton has been called “the Queen of Agrobacterium” for her discovery of the process by which genes can be inserted into plants, leading to the field of modern agricultural biotechnology. Now in her seventies, Dr. Chilton continues to work in her research lab at Syngenta in Research Triangle Park, N.C., in the building named in her honor. She loves being a grandmother to children on the east and west coasts of the United States and enjoys singing in her church choir. Mary-Dell Chilton was named a World Food Prize laureate a few weeks ago. There’s a new interview with her on YouTube www.youtube.com/syngentabiotech and some additional information about her background at http://www.syngentabiotech.com/news_releases/news.aspx?id=175104. UPDATE! Jack Mitchell brought it to my attention that Mary-Dell Chilton was just named Tar Heel of the Year (2013) by the (Raleigh, NC) News and Observer. This entry was posted in Agriculture, Biology, Chemistry. Bookmark the permalink. (3) the early history of industrial partnerships with academic research.